The 19th century cholera epidemics killed millions of people across the world, ravaging great metropolises like Paris, London and Chicago. But by the early 20th century cholera had more or less disappeared from the economically advanced countries of the world. Thanks to the work of early pioneers in epidemiology and infectious disease, policymakers began to realise that poor sanitation and sewage systems were the root causes of these deadly pandemics. Beginning in the mid-19th century, engineers like Joseph Bazalgette constructed vast sewer networks to handle the sanitation needs of cities like London. The people of the Western world had universal access to clean drinking water and working sewers, and the great stench across the Thames began to subside. As of 2017, the poorer countries of the world still lack the economic means to implement water purification and sewage systems on this scale. Even as cholera and other diarrhoeal diseases have disappeared from advanced economies they have tragically persisted in developing countries like Bangladesh, where they predominantly affect the most vulnerable communities. Mortality from cholera has been substantially reduced due to the development of oral rehydration therapy (ORT), a cheap mixture of salt, sugar and water that can be prepared at home. 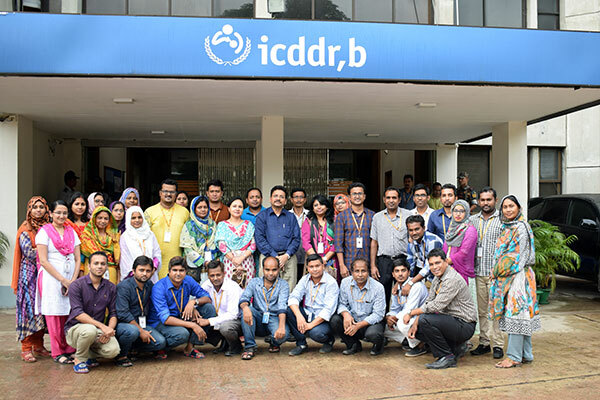 Research efforts at the International Centre for Diarrhoeal Disease Research, Bangladesh (icddr,b) and other organisations have made ORT – a routine component of diarrhoeal disease treatment across Bangladesh and many other resource-poor countries. It is estimated that ORT has saved over 50 million lives since its inception in Bangladesh. However, cholera still remains a major public health concern. According to the WHO it is estimated that there are 1.3 to 4 million cases of cholera a year, leading to tens of thousands of deaths annually. Even with ORT, it is vital that researchers find effective solutions to limit the spread of cholera and diarrhoeal diseases in areas lacking the resources to build functioning sanitation infrastructure. Limiting the spread of cholera necessitates identifying high-risk channels for disease transmission, and designing interventions to tackle them. Previous research in Bangladesh has shown that household contacts of cholera patients are particularly susceptible to infection – they have a >100 times risk of contracting cholera in the week after the first patient seeks hospital care. Thus, these household contacts present a very attractive target for interventions to reduce cholera transmission among families and in the neighbouring population. 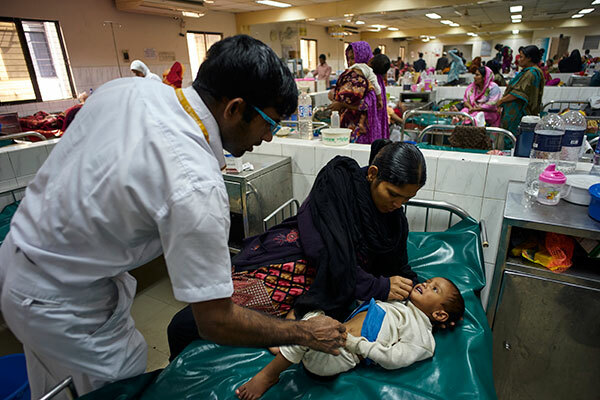 In Bangladesh, the standard of care for patients presenting at hospitals with severe diarrhoea is to provide them with packets of ORT solution. While this is a proven and effective way to reduce cholera mortality, it does nothing to address the risk of infection faced by the household contacts of cholera patients. The time spent by cholera patients and their family members in hospitals during an episode of severe diarrhoea is an under-utilised opportunity for medical professionals to promote water sanitation and hygiene (WASH) behaviours that could reduce the risk of further transmission. 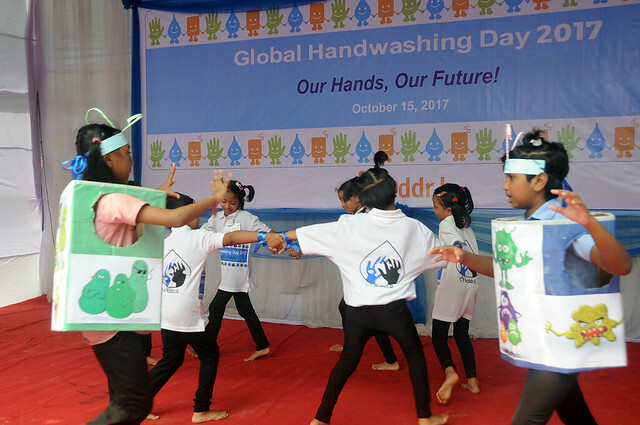 A 2015 Cochrane Review evaluating 22 different randomised controlled trials found that promoting handwashing could reduce diarrhoea incidence by up to 30%. 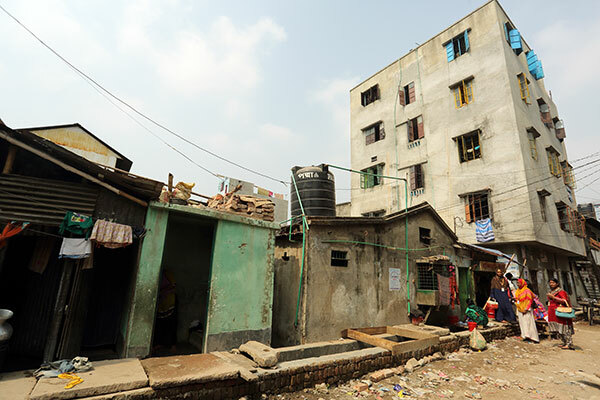 Behavioural modification interventions promoting better WASH practices could, therefore, help to overcome the structural problem of substandard sanitation infrastructure in resource-poor settings like Bangladesh. Based on this body of evidence, researchers from Johns Hopkins University have been collaborating with colleagues at icddr,b to develop a new intervention called the Cholera-Hospital-Based-Intervention-for-7-Days (CHoBI7). The acronym “CHoBI” corresponds to the Bengali word for picture – “chobi”. The CHoBI7 protocol is fundamentally quite simple – families affected by cholera are educated about WASH practices and provided with materials such as chlorine tablets and water storage vessels when they come to the hospital during an episode of severe diarrhoea – but its implications for cholera transmission could be profound. 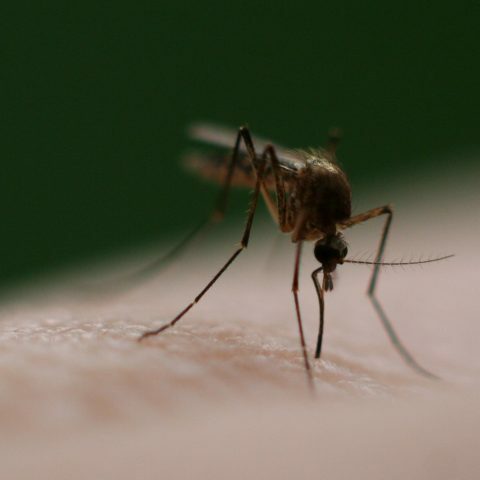 The results so far have been very encouraging for the CHoBI7 team, led by Dr Munirul Alam, icddr,b senior scientist and Dr Christine M George, assistant professor at Johns Hopkins University, both principal investigators of the CHoBI7 study. 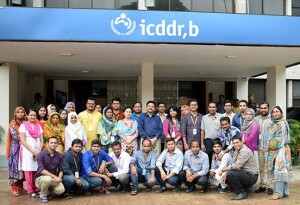 The first randomised, controlled trial of CHoBI7 was performed from June 2013-November 2014 at icddr,b’s Dhaka Hospital. 219 household contacts of 82 cholera patients were assigned to receive the CHoBI7 protocol, while 220 household contacts of 83 cholera patients acted as controls. Results from this initial trial support the idea that CHoBI7 can promote better WASH practices and reduce cholera transmission in the time immediately following the first hospital visit. Nine days after the initial hospital admission the intervention group had a 47% lower incidence of Vibrio cholerae infection than the control group, demonstrating that CHoBI7 can significantly limit the spread of the pathogen at this sensitive point of elevated transmission risk. 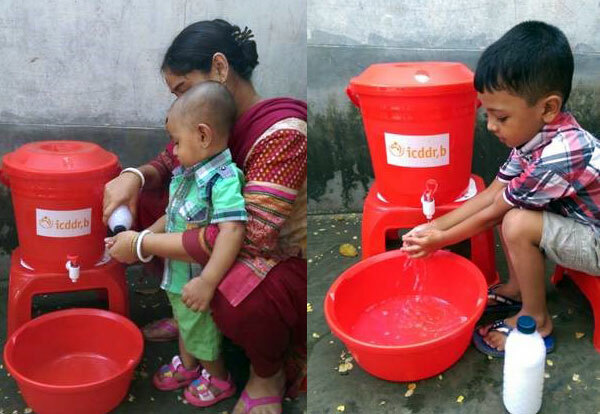 A follow-up evaluation of trial participants, 6-12 months after the initial intervention, assessed whether there had been long-term uptake of better WASH practices using a 5-hour structured observation of handwashing behaviours. The group that had received behavioral modification messages was 4 times more likely than the control group to wash with soap at critical points in the structured observation, demonstrating that CHoBI7 can lead to long-lasting behavioural modification with respect to WASH practices. Subsequent analyses of the CHoBI7 trial have identified psychosocial factors mediating uptake of improved WASH practices and risk factors for familial transmission of Vibrio cholerae in affected households. The CHoBI7 protocol offers a very attractive solution to the lingering problem of water-borne diarrhoeal disease in resource-poor settings. It identifies a sensitive contact point for behavioural modification messages – household contacts of hospital admissions for severe diarrhoea. It allows medical professionals to directly reach these people at a time when they are more likely to be receptive to behavioural change messages. By piggybacking on existing hospital infrastructure, it also avoids the costs associated with resource-intensive door-to-door campaigns or nationwide advertising. Ultimately, there is no “magic bullet” to solve the complex structural and cultural problems associated with poor sanitation and hygiene in resource-poor settings. But the evidence from this initial trial suggests that interventions like CHoBI7 could play an important role in changing the standard of care for families affected by cholera, significantly reducing the burden of deadly diarrhoeal diseases in the absence of functioning sanitation infrastructure.